This goes through the update which takes a couple of minutes depending on how fast the network is. You may be prompted to enter a “Y” at various stages of this process. Install wget because you will need it later in the installation process. Once it’s pasted (by right clicking), hit Control+X and then Y then Enter to save the file. If you plan on running Webmin on a different port, you can skip adding 10000 as a permanent rule and set it later with the port of your choice. 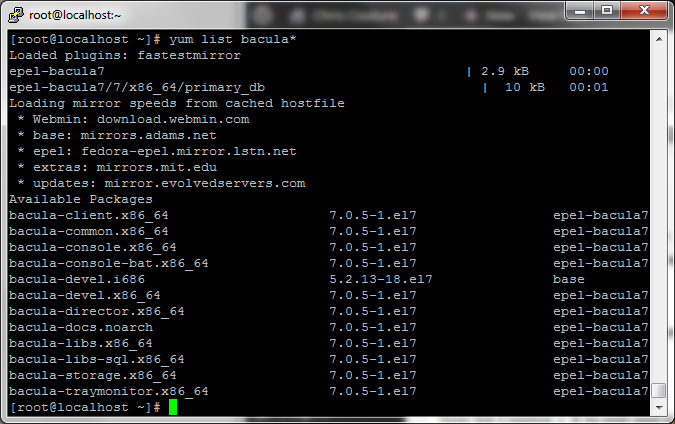 Now that I have Webmin installed and running, it’s time to install Bacula. NOTE: the latest version may be different than shown above so be sure to change it if that is the case. Now hit Control + X to exit and hit Y and then Enter to save the new file. If you don’t see Bacula 7, verify that you did the steps above correctly. Next you need to run through the secure installation process for MariaDB which will allow you to set the root password, remove test users etc. The prompts are easy to follow and everything should be Yes. The default root password is blank to just hit enter and set a new root password. This isn’t the password you will use for Bacula, it’s the root mysql password. After you have completed this step, you will want to go to Webmin which you installed earlier so you can set up the database and a Bacula user for the database. If you look under Servers, you will probably not see MySql Database Server because you just installed it. You will need to go to Refresh Modules at the bottom of the menu and click it. Now you should see MySql Database Server in the list. Click it and you will be asked to enter the username and password for the database. This will be root and the password you just entered when setting up the database. 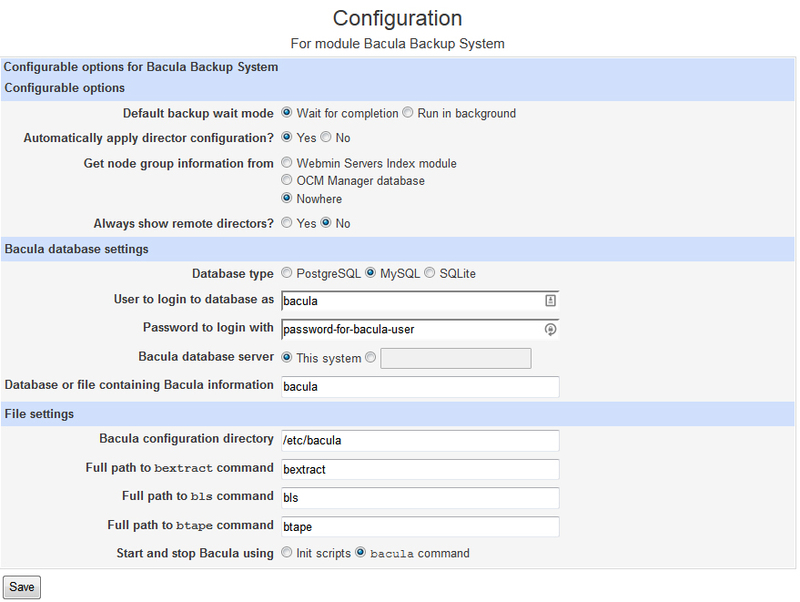 Now you will need to add a bacula database so click Create a New Database. Type in bacula as your database name for your bacula database and leave the rest of the fields default. Note, the name must be bacula! Now you will need to create a bacula user for your database. To do this, go to User Permissions and Add User to add the user. Be sure to set the Hosts to localhost and don’t worry about setting permissions. Click Create. Now you will click on Database Permissions and add all permissions except Grant for the user you created to the bacula database. Once again, be sure to have the hosts set as localhost. Enter the password you used for the user. There are 3 programs which provide ‘libbaccats.so’. Hit 1 and press enter to select MySql. 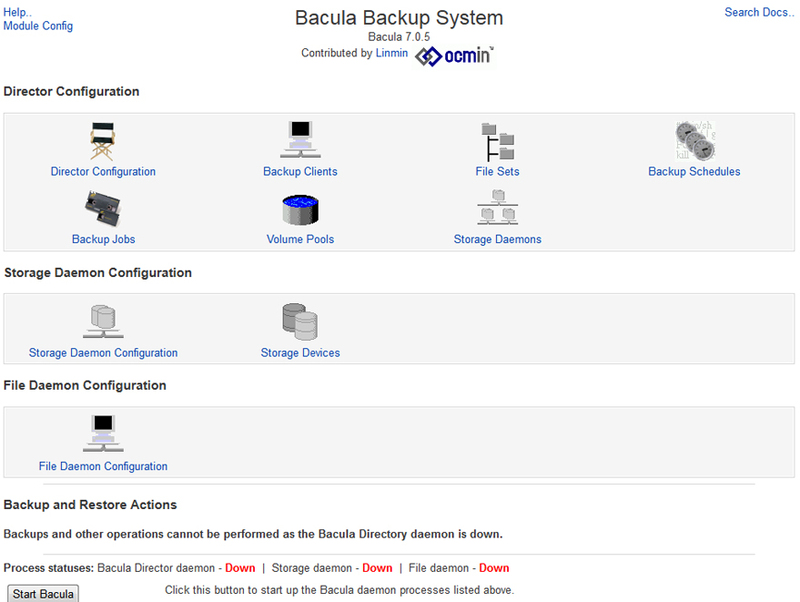 Now you should be able to go to Webmin and look under System and you will need to click on Bacula Backup System. Don’t worry if it gives you an error. This is because you haven’t set up the config yet. 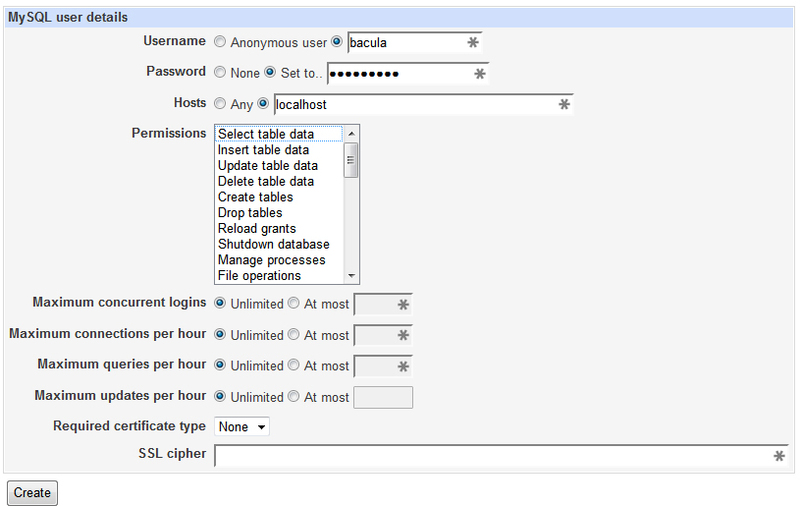 You will need click on Module Configuration and set it up to use MySql and enter the login information you created previously for your Bacula user. Click Save and you should be able to access the Bacula page where you can set up your Bacula System. Now that you have that part working, you still can not start any of the daemons yet since they are not set up. You will have to go into each file and modify them so that they will communicate with each other. The Bacula console command /sbin/bconsole could not communicate with the Bacula director. Make sure the password in /etc/bacula/bconsole.conf is correct. You can either use the File Manager within Webmin or connect to your server using sftp and look in the /etc/bacula directory and you will find the following files you need to edit. I just drag them back to my desktop and edit them in a text editor. There are a lot of passwords and IP addresses that need to be changed in there files so pay attention to and @@PASSWORD@@ areas and change them accordingly. 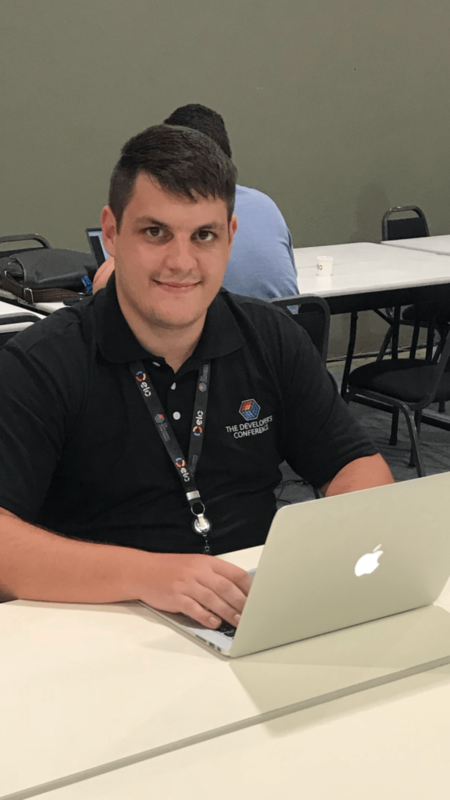 Be sure to catch the bottom of the bacula-dir.conf file and change the catalog database password to the one you assigned when you created the database user. Also, look for localhost and change this to your local IP address on your backup server. You don’t need to do this on the clients since you will be setting those up later on. In fact, you can delete most of the test clients that are in the default if you wish. I will post a guide on setting up all the configuration files later on. In order to allow clients and consoles to talk to your Bacula server, you need to open ports 9101, 9102 and 9103. 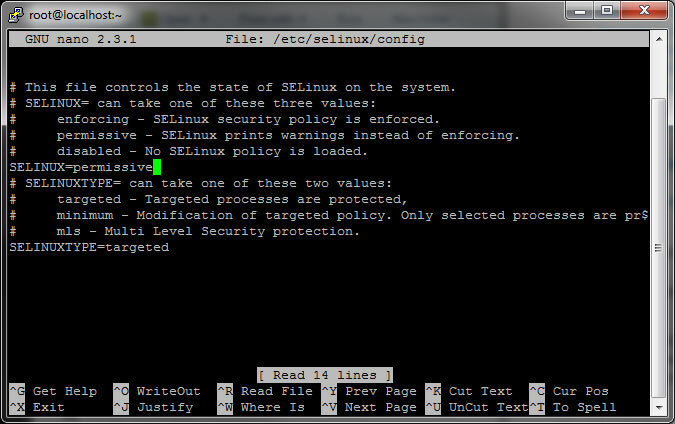 The following command in your SSH console with open these ports. Now you should be able to start Bacula and see all of the Daemons are showing UP. Now you need to get the web files. Go to the Bacula-Web website and download the latest version. Save and unpack the archive to your desktop or another location. We will need to modify the config file before uploading to the server. Open the Application/Config directory and rename config.php.sample to config.php and then open it in a text editor. 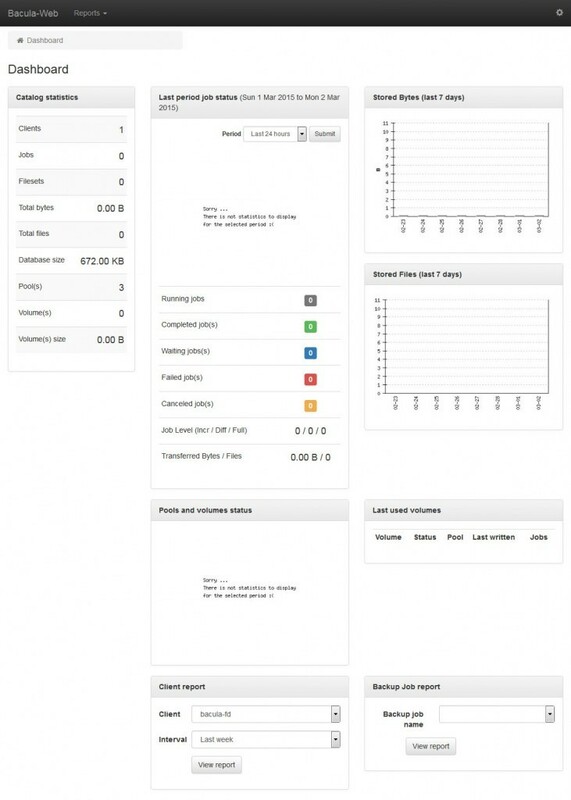 Look for the MySql area and change the settings to match your server. Be sure to uncomment the config settings be removing the “//” in front of the $config settings. You probably just need to edit the password at this point. After you have saved the config file, you need to upload the files to your server under the /var/www/ directory. You can SFTP to your server using FileZilla and the IP of your server. If this server is only serving as a backup server, you can upload the files into the root HTML directory, otherwise you can put the files in whatever directory you wish. Go ahead and upload the files now. Make the change and save the file then re-upload it to the server. Change if from enforcing to permissive and hit Control + X then Y then Enter to exit and save. After the system comes back online, you should be able to use your IP address to access Bacula-Web! Pretty! This haas been an extremely wonderful article. I just couldn’t depart your site before suggesting that I actually enjoyed the standard information an individual provide in your guests? and I must say this blog loads a lot faster then most. Can you suggest a good hosting provider at a reasonable price? Hi friend, I use a non-US hosting with a company https://www.hostinger.com/ Thanks. Thank you, man. Any problem is here. of people will miss your wonderful writing due to this problem. What’s up mates, fastidious post and good arguments commented here, I am genuinely enjoying by these. This site is made for everyone to access. Hi to all, for the reason that I am truly eager of reading this webpage’s post to be updated on a regular basis.